Hull strawberries and slice into a bowl. Add fresh blueberries. 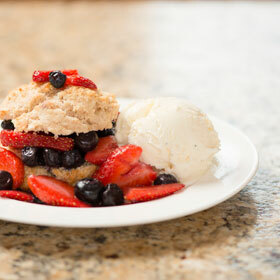 (If using frozen blueberries that are defrosted, stir in just before assembling shortcakes.) Mix in orange juice and sugar to taste. Set aside 30 to 60 minutes. Preheat oven to 425 degrees. Spray a nonstick cookie sheet with oil spray. Set aside. In a medium bowl, mix together the flour, salt, baking powder and sugar. Use a pastry blender or a fork to cut the butter and oil into the flour mixture until it resembles coarse meal. Add the milk all at once. Stir until it is just incorporated and there are no lumps. Form 8 biscuits by dropping well-rounded quarter cups onto the cookie sheet. Bake 15 to 20 minutes, or until biscuits are done. (Use a toothpick to test centers. Insert toothpick into center of biscuit; toothpick should come out clean.) Cool on a wire rack. Use a serrated knife to gently slice off the top third of each biscuit. Top with some berries and juice. Lay the top third of the biscuit on berries. Top with more berries and juice. Place remaining berries around each biscuit. Garnish with frozen yogurt, if using, and serve. Serving size: 1/8 recipe. Amount per serving: 270 calories, 11g total fat (2g saturated fat), 41g carbohydrates, 5g protein, 4g dietary fiber, 405mg sodium.